Having traveled to South Korea in 16 days, I couldn't really say we have been all over the country. Frankly, 16 days really isn't enough! There are just to many things to see and places to explore. Given this limited time though, I still managed to squeeze in all places and activities recommended by local and foreign tourists alike and make an itinerary me and my friend was able to enjoy. 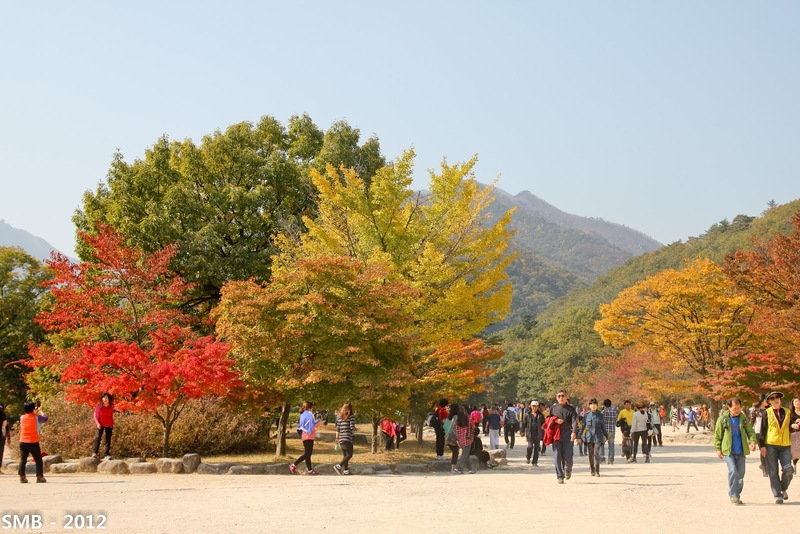 We did not really plan to go during autumn when we booked our flight, it just happened so, which was wonderful timing, as for me this is the perfect season to travel. Not just because it's cold and you wouldn't really worry about sweating all over the place (lol mental image) and the heat of the sun clashes with the cool wind so it's just perfect. 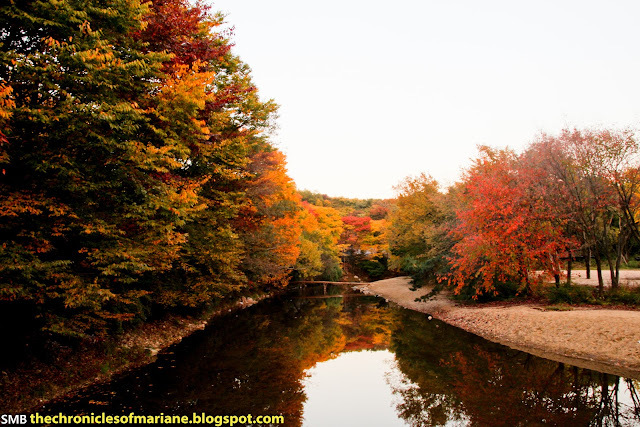 The colors of fall is just fantastic, every picture you take would look amazing! 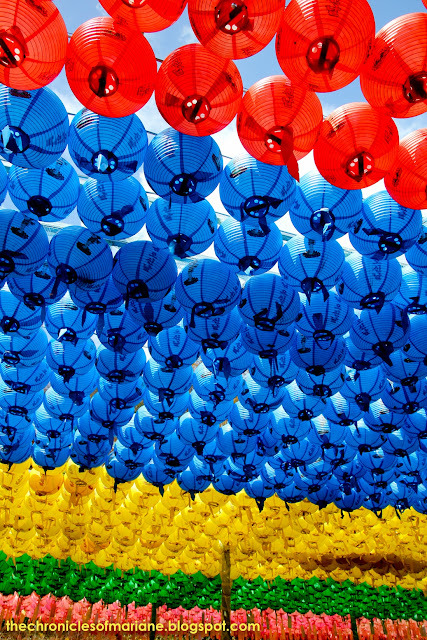 Making your trip to South Korea is a piece of cake. Why, you say? 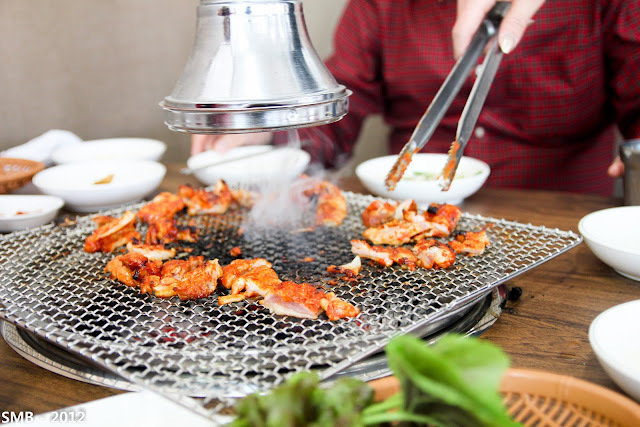 Try to visit http://www.visitkorea.or.kr/intro.html and you would know why. VisitKorea has EVERYTHING you need! The information in this site is so detailed and massive and they also offer this free hotline (1330 Korea Travel Hotline) wherein you could basically ask ANYTHING related to travel around the country and they'd be happy to help you. 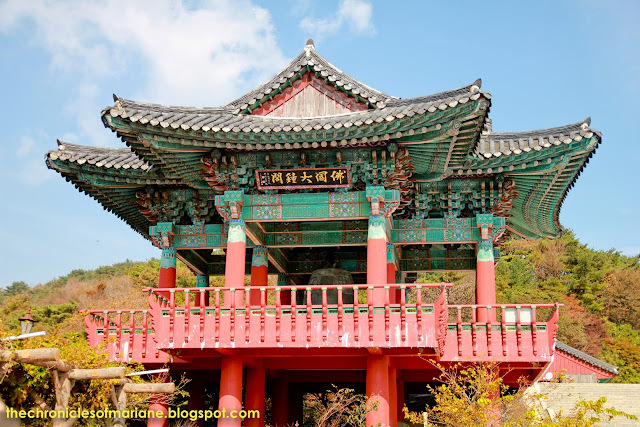 I really recommend this site and if you're going to Korea, I think that you should check out VisitKorea first before searching anything at Google. Going around Korea via local transportation can get very cheap,s o for those Pinoys out there, don't worry too much about this part. Food and shopping will take most of your budget. 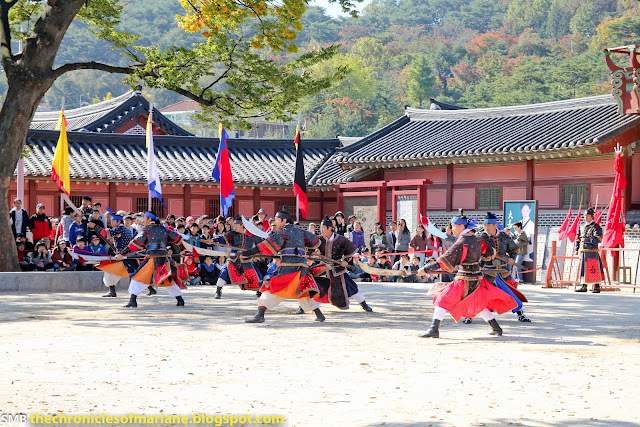 Sharing you a summary of our itinerary for South Korea. Lots of things were planned, however, there were times wherein you could not really predict what's gonna happen (ahem ahem very rainy autumn! ), so all we could do was to adjust. Also, I considered three main factors before planning: money, availability and reviews of the places. If you're interested, I can also share the initial itinerary I made (excluding Seoul since I did not plan for that one) and also the daily schedule that we have actually executed by going to this link. A got a request via email if I could upload a map of our itinerary here as well. This is so you could have a clear picture of our itinerary and something that could also help you plan yours. It was such a cool morning when we arrived. From that day on, I was convinced that autumn has to be my favorite season. :) Anyhow, we were able to get a bus from Incheon going to Chuncheon and met up with our host. If you have been following my posts on Korea, you would know that I have Couchsurfed for 16 days and was also one of the most memorable part of the trip. 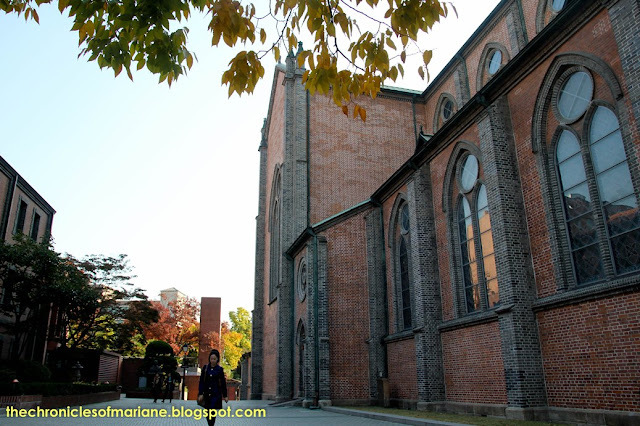 The next day, we took a 9 AM bus from Chuncheon going to Sokcho. 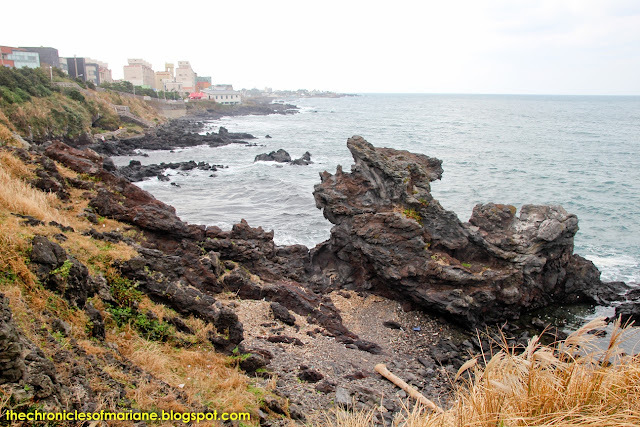 The city also had a very relaxed feel, especially it being close to the ocean. For those who need a map of the city, there's an available tourist information center nearby the bus terminal. After a very quick walk over the city, we took a bus going to Seoraksan. There was quite a traffic going up as we went on a weekend however it was still an enjoyable ride as I felt like I was on a "Sokcho city tour". Biseondae and autumn colors. I am in love! We left with a heavy heart, our host was very kind and so was Gangwondo. I felt like two days were not enough to explore the whole region. 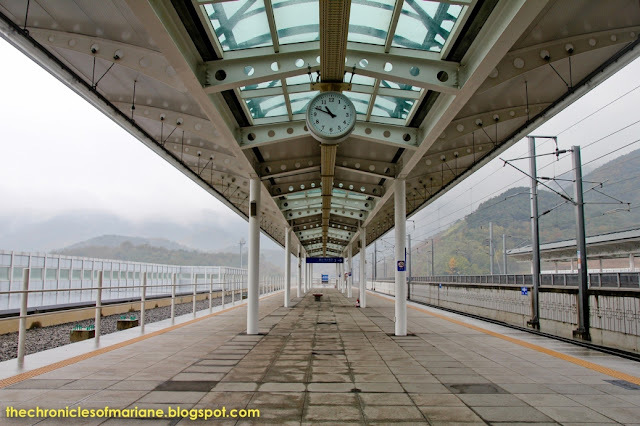 It was also raining VERY hard that day from Chuncheon all the way to Yongin, which made commuting so terrible with all our heavy bags. We met up with our host who was kind enough to fetch us at the station with umbrellas. We spent our whole morning chatting and also waiting for the rain to pass. 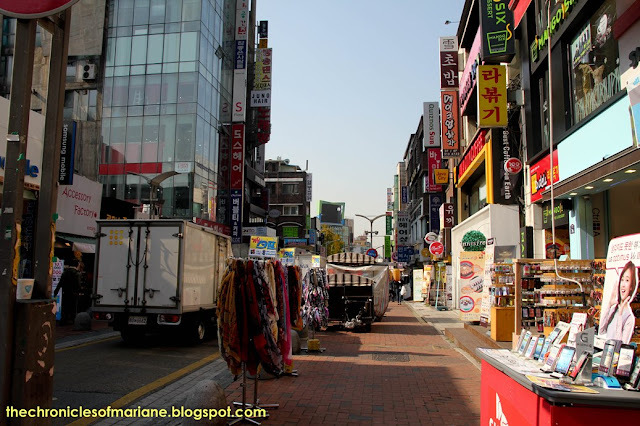 Late afternoon, we went out to explore Yongin, do some window shopping at Shinsegae and eat around Jukjeon Cafe Street. Comparing Seoul to Yongin, the latter seemed more laidback and less crowded, I now understand why our new host and her family preferred to stay here rather than in the city of Seoul. 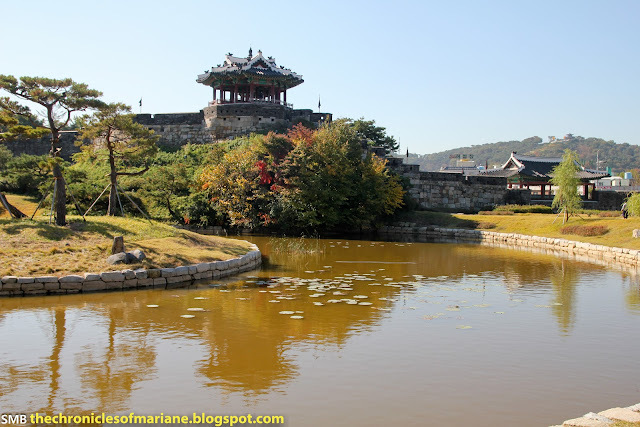 We were greeted the next morning with nice and warm Mr.Sun, and we were finally able to visit Suwon Hwaseong Fortress that was originally planned for the previous day. The area was historical and so picturesque we spent until late afternoon roaming around, and felt like we still did not have enough time to see everything. We took the free shuttle bus from Suwon to Korean Folk Village after and managed to make the most out of it given our very limited time. 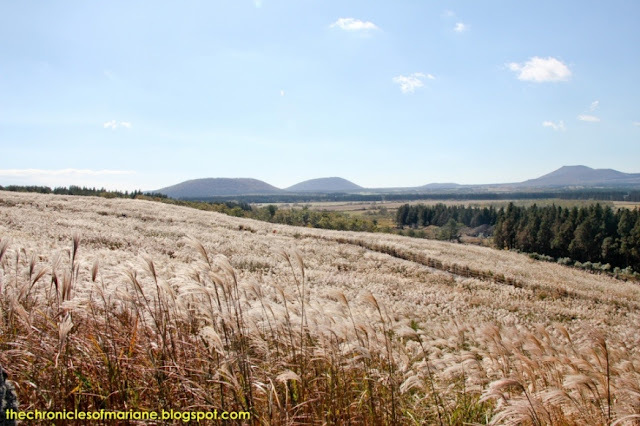 The nature that surrounds the area was very beautiful, please do not forgot to take pictures when you're here. I really regret that we did not have any brochures to have more detailed knowledge on the displays in the village and we did not get to watch any of the cultural shows as we arrived late and did not have much time. The next day was spent all throughout at a themeland called Everland which my friend enjoyed but I thought was so-so comparing to Hong Kong Disneyland and Singapore's Universal Studios. The next day was full of mishaps. We ended up missing our train and our host as well, so we didn't really do anything much that day except to eat. 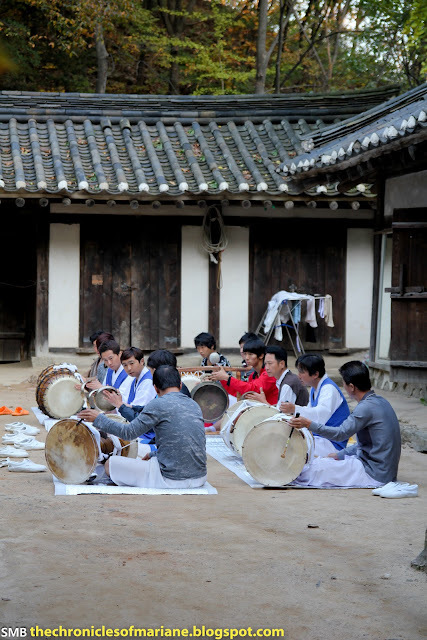 We were supposed to go to Andong Village that day but of course, due to the earlier event we had to cancel. We could have gone somewhere else but our bags that contained our valuables were too important to leave. The train station employees were nice though they could not really commit and be responsible for our stuff so we had no choice. The following day was spent on getting to know Gyeonju and its very historical roots. I liked the feel of the city which seemed very relaxed and friendly. 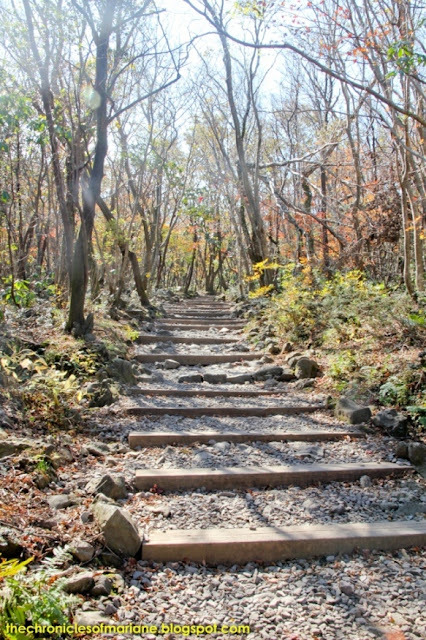 The hike up Seokguram Grotto was a breather, though I think our host felt a bit disappointed as he did not really see what he was expecting to see. 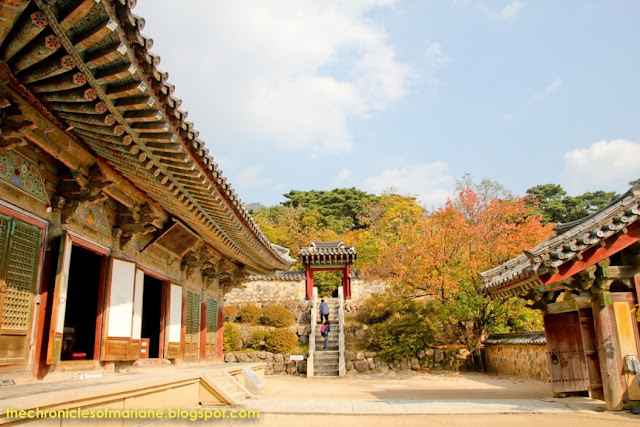 Add the lovely Bulguksa Temple to the list to complete your "Autumn in Korea" experience. 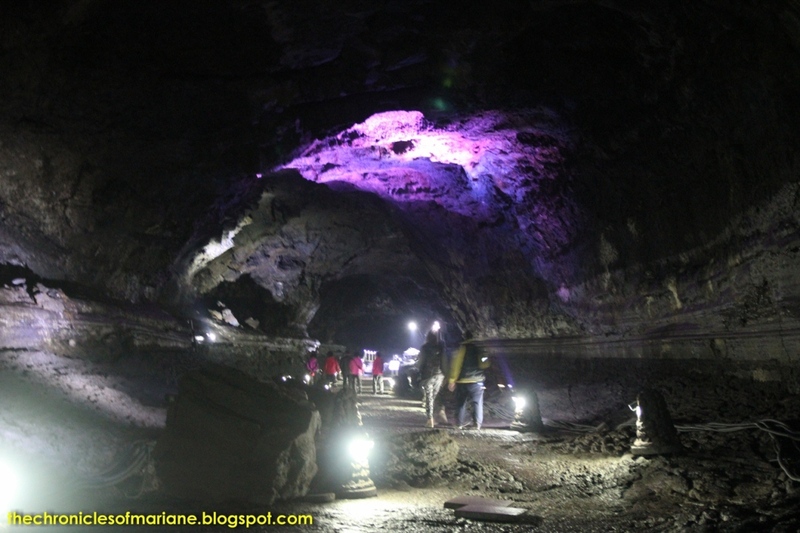 The whole area was very extraordinary not just for its historical significance, but also with its charm that will surely captivate you and compel you to take those award-wining photographs (though I mostly just stared at my surroundings to my amazement on its beauty). Our afternoon was spent roaming around the city and eating more food. And later that night, we went around the area of Cheomseongdae Observatory and Anapji Pond, both looked magnificent during this time of the day. Good thing it was very sunny the next day so we were finally able to go out. 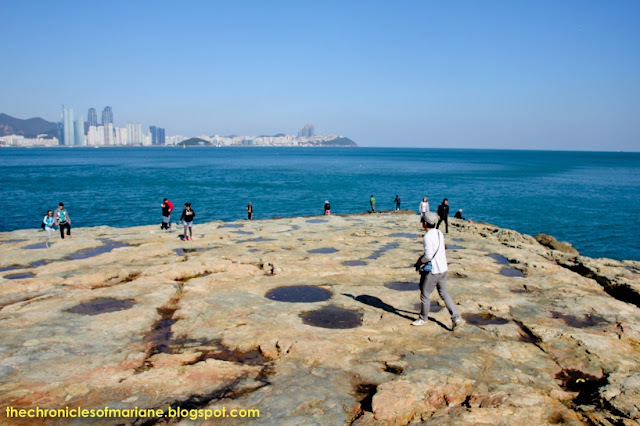 Our host showed us around the Igidae coastline and explored Busan in the eyes of a local. It was a very special experience walking through this magnificent area in a very perfect weather. 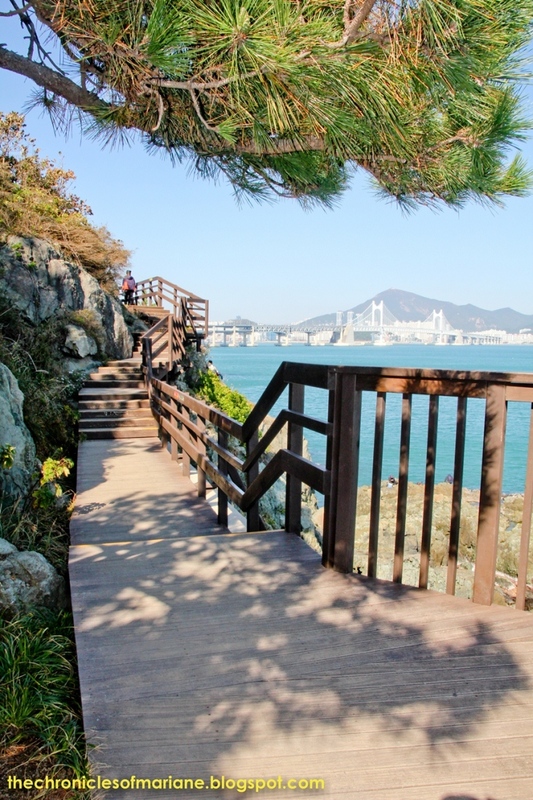 I would have wanted to spend the whole day just having a picnic and staring at the sea and the lovely view of Busan, but of course, we had other plans. 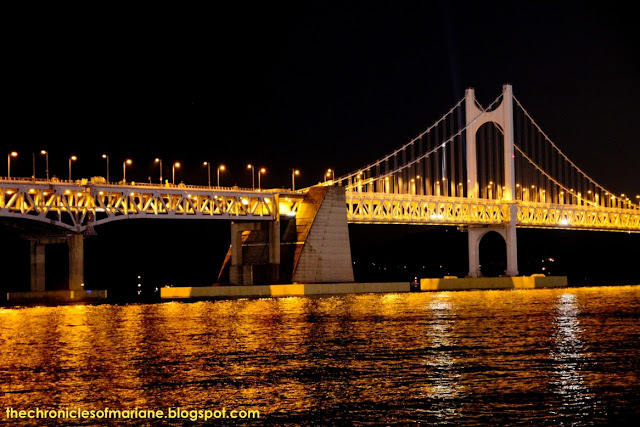 We spent one of our best nights in Korea at Gwangan Bridge to see the Fireworks festival being held every year in this city. The experience of eating fresh sashimi with beer while having a nice conversation with our new "brother" from Busan was also memorable. The entire display lasted for only an hour but it was definitely fun. It could get very crowded too so plan ahead on how you'll be going home afterwards. 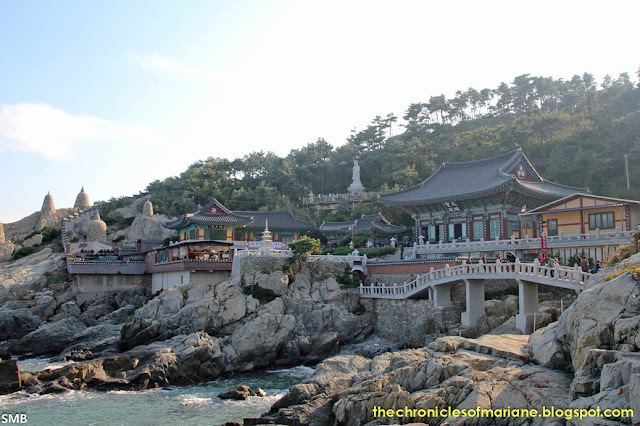 We woke up very late for our last day in Busan but we didn't cancel our trip to Haedong Yonggungsa Temple even though it was quite far from the city center. 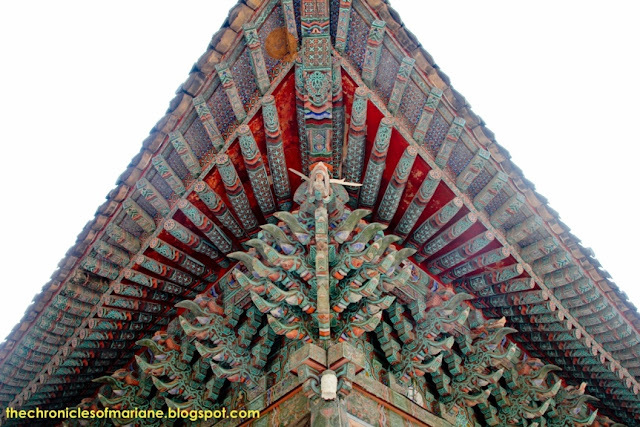 The temple took me into a different level of knowing Korea. 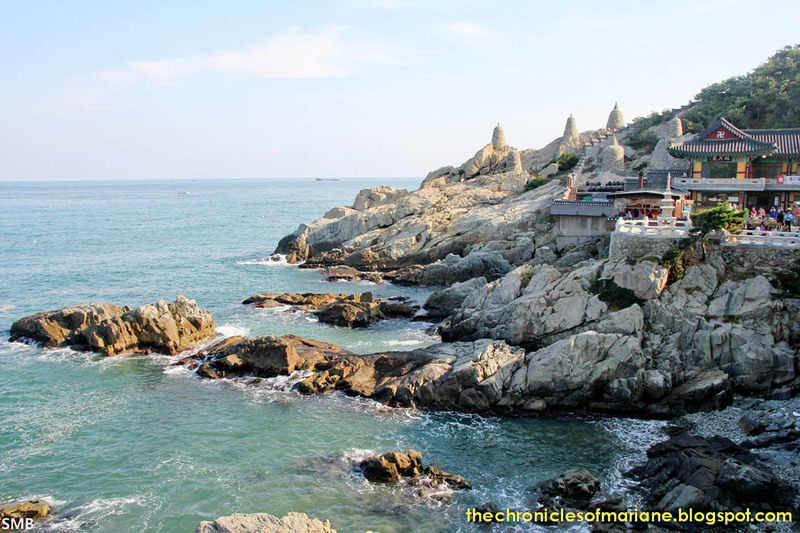 It looked amazing especially with the arrangement of rocks separating the sea and the temple. 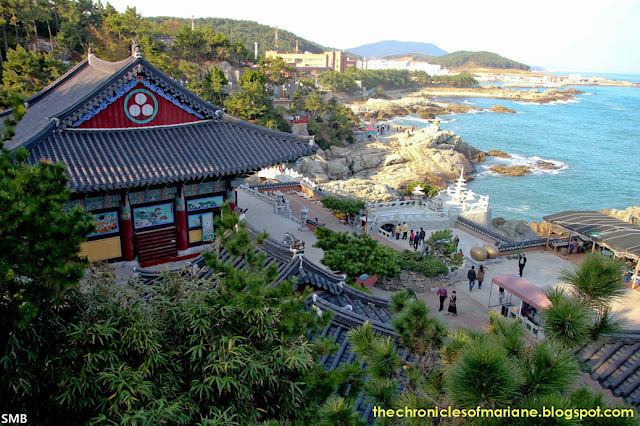 The architecture of the temple looks fantastic, and for me, it's a must-see for people visiting Busan for the first time. I think it certainly is a one of a kind structure overall from the palaces and temples we have visited, it being situated nearby the sea gives a different feel. 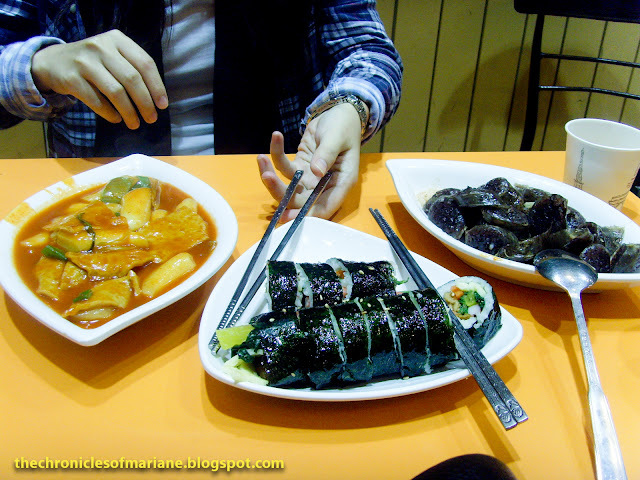 It certainly was a good way to end our exploration of Busan. We took a plane that night going to Jeju via Jeju Air which our host helped us book. We decided to commute going around Jeju for our first day, due to this, most of our time was lost just waiting for the bus to come and adjusting to the time schedule. It was still good experience getting to know the bus system in the region. 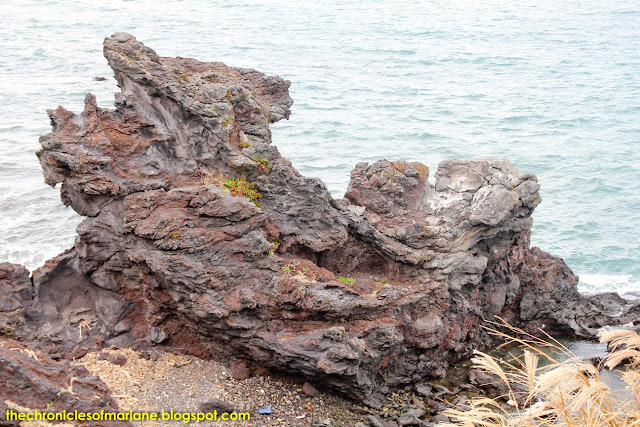 We had a quick lunch of Altang after we went to see the famous Dragon Rock that was quite close from the airport. It was a pretty unique structure and could probably be a good place to visit first as it is the close to the airport. 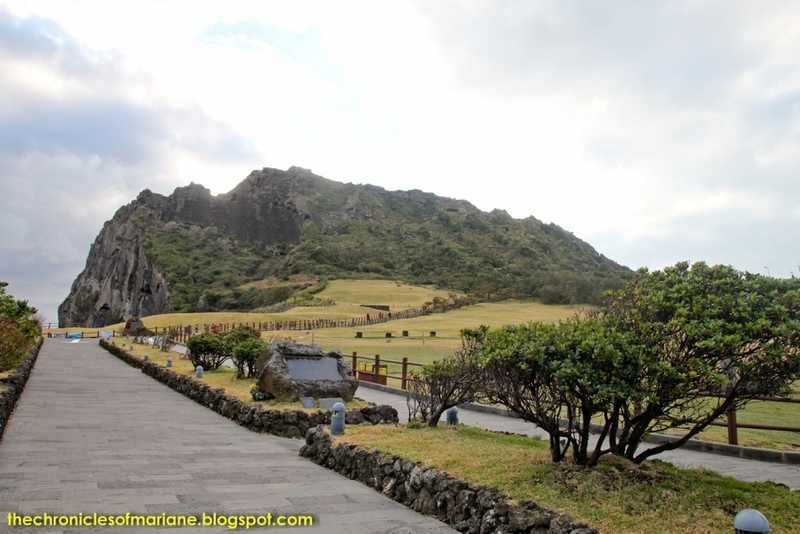 The Jungmun Complex was our target for that afternoon and to start it off we went to the botanical garden but unfortunately, was already closed at the time, so we headed off to Jusangjeolli cliff instead wherein we were also able to catch the beauty of Jeju during sunset. My SLR's battery died and I was prompted to use my digicam, but was still able to capture a gorgeous photo of this nature's wonders. 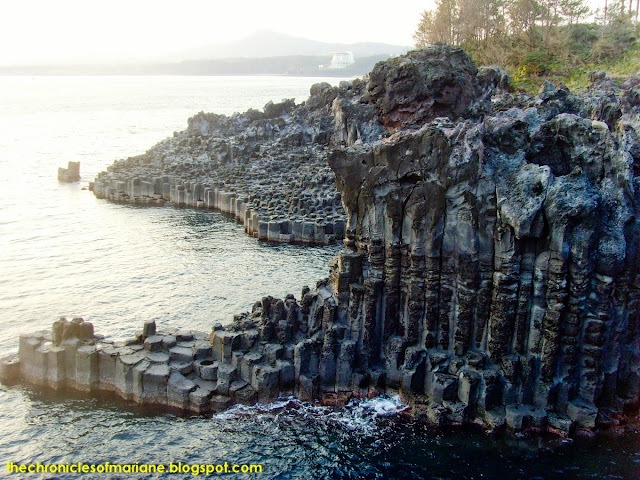 No wonder I have also seen lots of photographers in the area, this probably is one of the spots that can give you a majestic view of nightfall in Jeju. I finally gave in to my friend's request and went to see K-drama related tourist spots such as the Teddy Bear Museum and we also did a quick stroll around the The Seaes Resort wherein some popular dramas have shot some scenes. We woke up very early the next day. 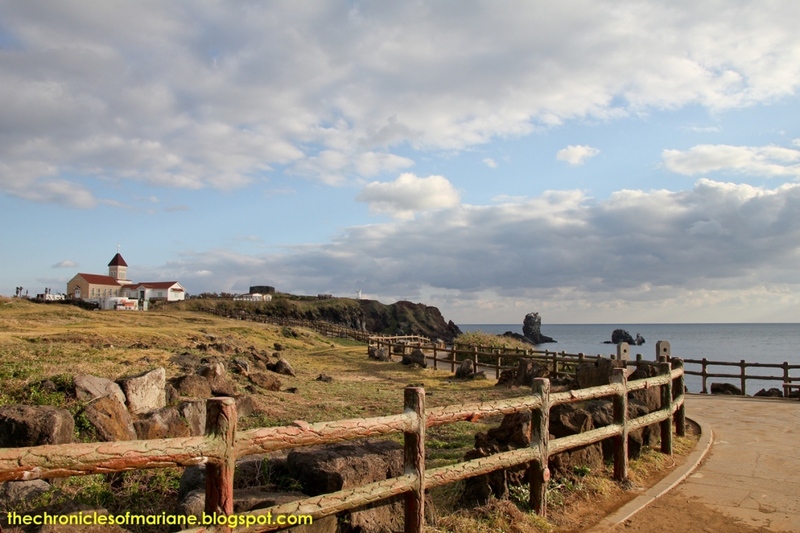 We booked a taxi driver to take us around some of Jeju's popular tourist spots and first on the list was to catch the sunrise at Seongsan Ilchubong, translated in English as Sunrise Peak. 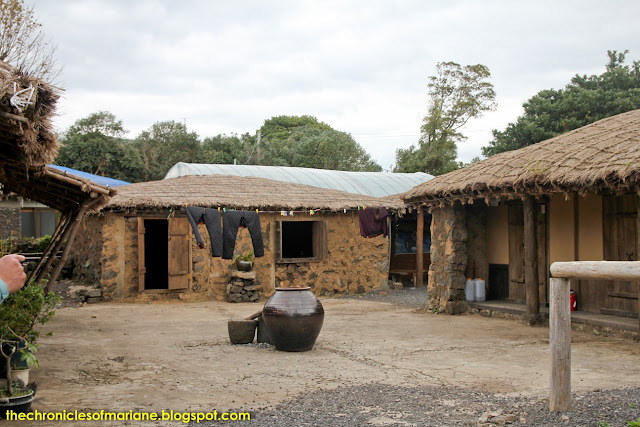 Afterwards, we didn't waste anytime to visit places such as Seopjikoji, place not only popular due to the drama 'All In', but also because of its stunning landscape, Trick Art Museum for fun and wacky paintings, Seongeup Folk Village for a taste of traditional life in Jeju, Sangamburi Crater, Hallasan, and Manjanggul Cave to see more of Jeju's natural beauty. 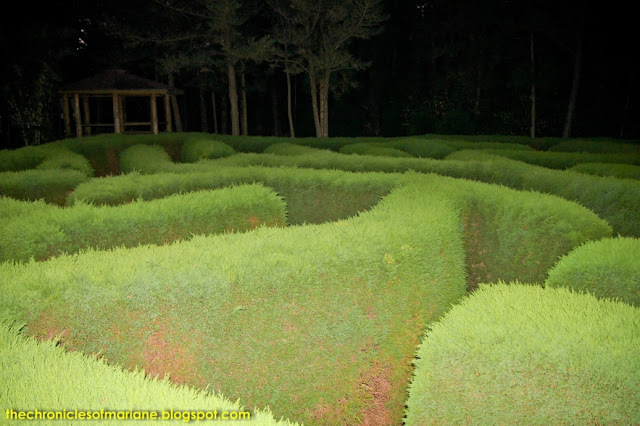 We ended our night with a fun maze not just for the kids at Gimnyeong Maze Park. 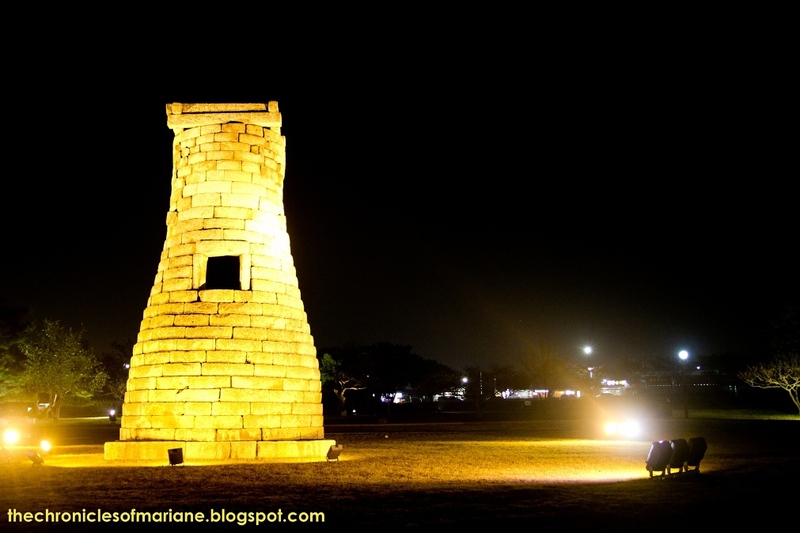 Even though it was quite disappointing with the event that happened with our host, our last night at Jeju was made perfect with a relaxing stay at jjimjilbang. Jeju has been an extravagant visit, not because this is probably the area where we spent most of our money at (transportation can be hard/costly at the area if you don't drive), but on the more positive note, our eyes were filled with such magnificent views of nature and breathtaking scenes. Even though we only had two days for this province, we were able to do see most of the things we planned for our Jeju itinerary. No wonder this region has many UNESCO designations and has also garnered the title as one of the "Seven Wonders of the World". 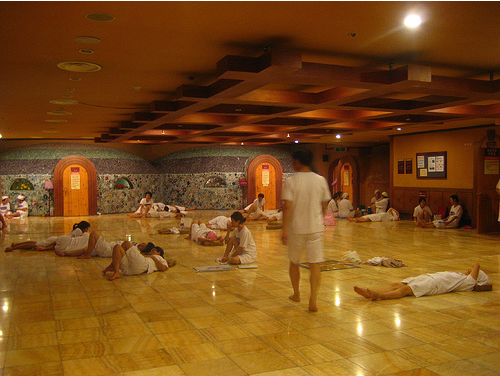 For me, this has to be on your Number 1 list on must-visit places when going to Korea. 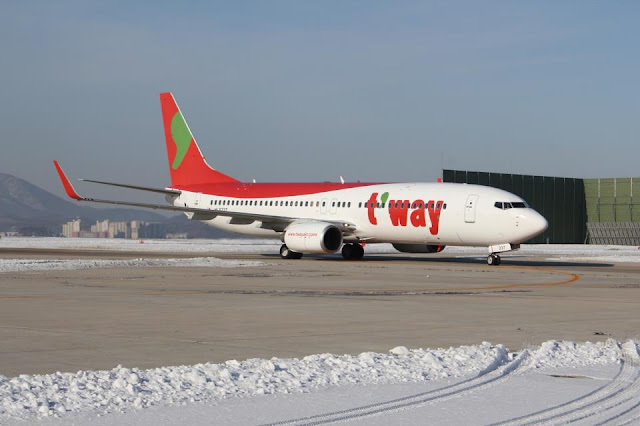 Convenient and cheap flight fares are also available in South Korea, thanks to Jeju Air and T'way Airlines. We have arrived at Seoul safe and sound, but yet tired and wanting to have a proper sleep. Seoul was our last stop for this trip and on our first day, we met with our host who was excited for us to meet her students. It was a memorable get-to-know session, though awkward at first, turned out to be fun. I think it was out first time on the entire trip to spend time with someone our age, me and the group immediately became friends. 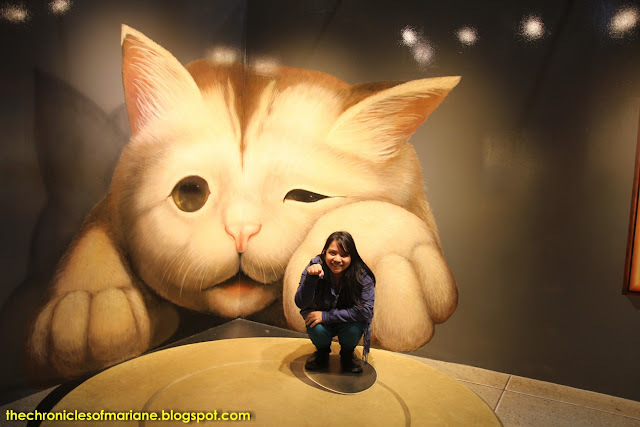 On the sad note though, we were only able to go to Myeongdong at almost 6PM so we were not able to proceed with our initial plan for the day. We just decided to spend our day in the Hongdae/Myeongdong area. We woke up very late the next day to compensate for the lack of proper sleep from the previous day. We had lunch and went to Changdeokgung Palace for our first stop. I felt like the palace was pretty okay, I didn't have much of a historical knowledge of the place, but as per the overall impact of it to me, it was not positive nor negative. Maybe the visit to Secret Garden could have helped. 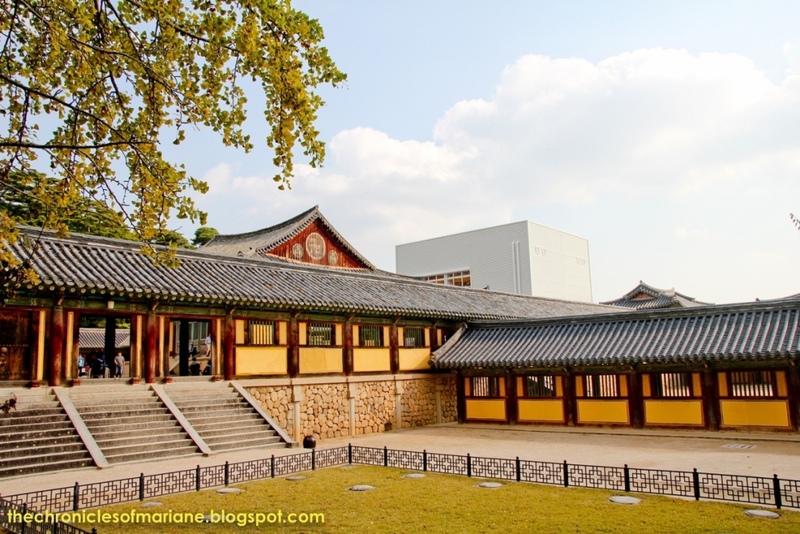 Gyeongbokgung Palace had more appeal to me as it had more scenic displays all over the area. 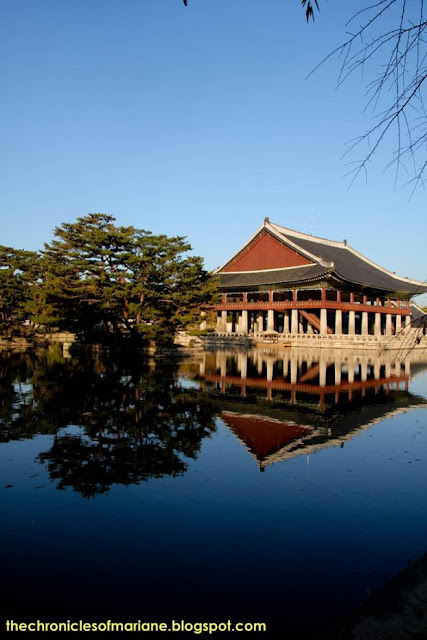 Though I was not able to explore it further due to lack of time, I liked it more than Changdeokgung, this is just my opinion though and my be different to your experience. 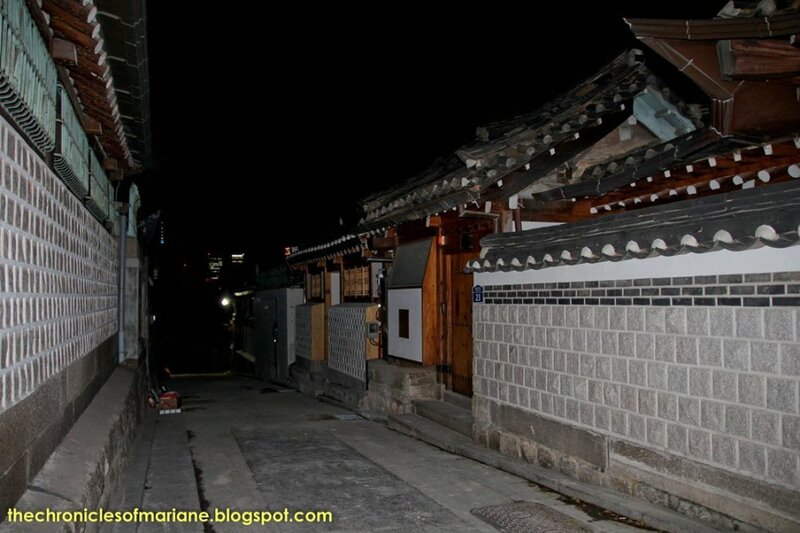 We went to Ganghwamun Square and to Bukchon Hanok Village afterwards. 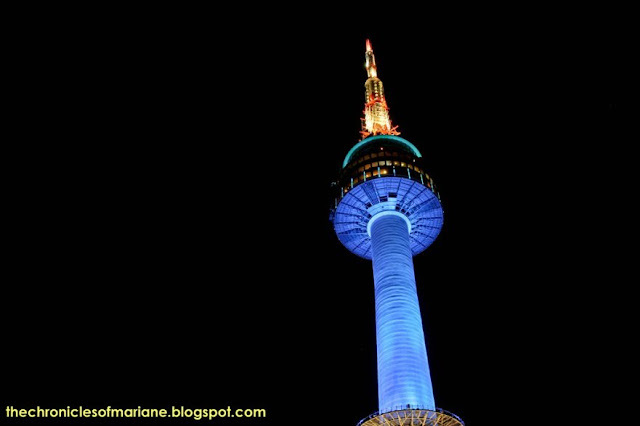 N Seoul Tower gave us a night view of the city later that day. I could have not asked for a better way to end my day but this. 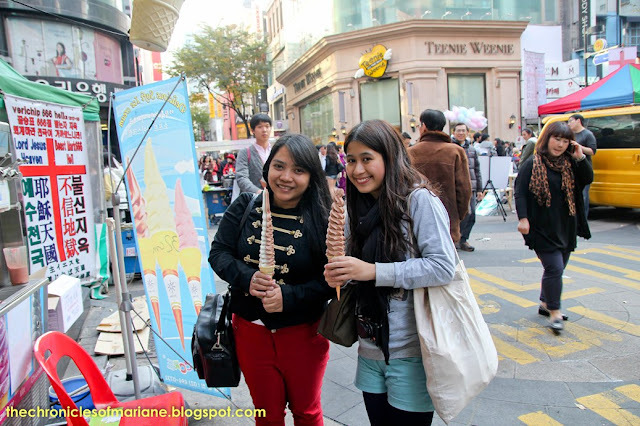 On our last day, we met up with a friend to Dongdaemun for last minute pasalubong shopping. However I forgot to take pictures so I decided to not blog about it. 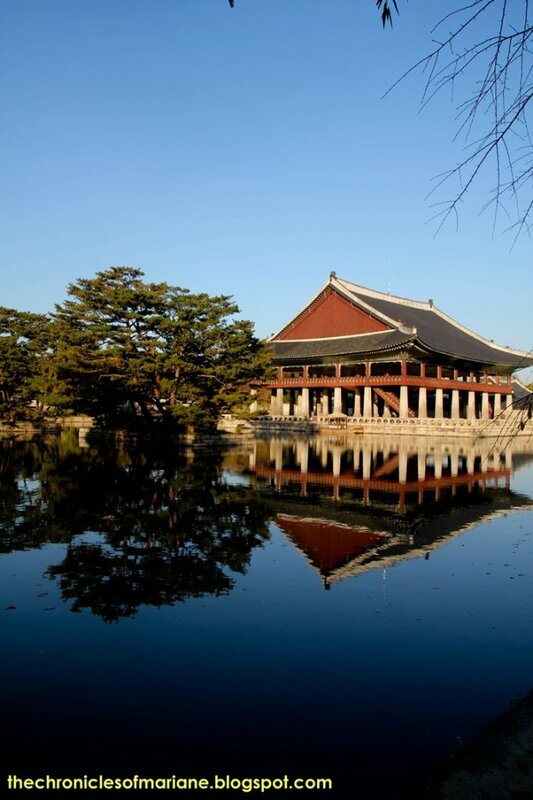 * Before the trip: Familiarize yourself with the Korean alphabet, Hangul. If you're lazy to study it, keep yourself motivated. It will only require you 1-2 hours of memorization and I assure you it will greatly help on finding those tricky tourist spots and when looking for restaurants that serves vegetarian/meat/halal food. 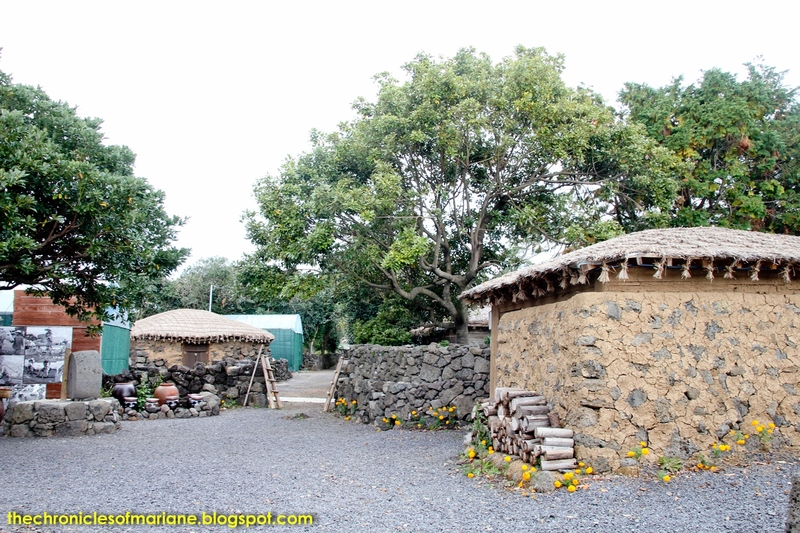 It would also help if you know how to pronounce correctly, sometimes you would not be understand by locals if you blurt out different sounds, one good example is a place in Jeju called "Woljeongni" but spelled as Woljeongli. * If you really can't spare time to learn Hangul, at least keep an app on your phone that can translate Korean-English and vice versa, and keep note of your itinerary in Korean (and the address of these places too). * Keep a copy of the train lines/stations and bus schedules. I find the buses more convenient (except in Seoul wherein I never rode any bus). T-money cannot only be used on trains, but also on buses, when shopping, etc. It is so convenient! I recommend that you buy a card as soon as you land and then just top up the value when needed. 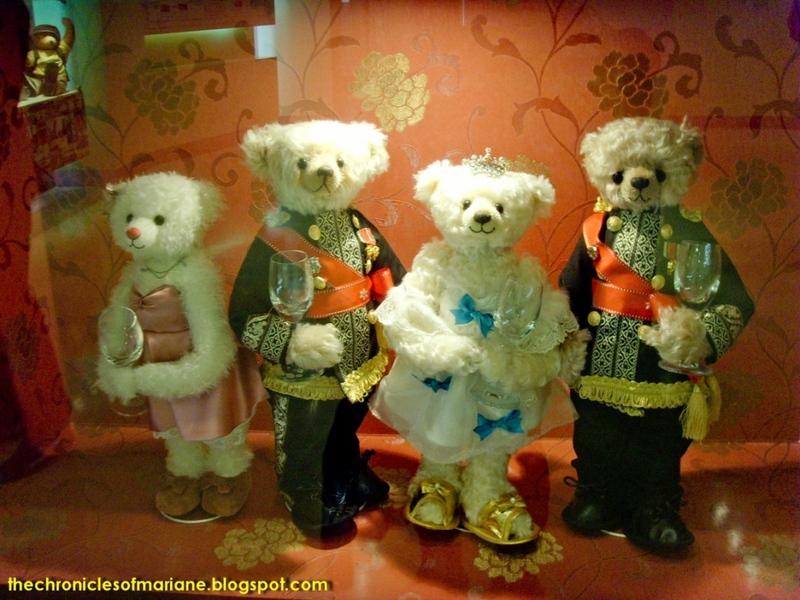 * I really recommend again that you check out VisitKorea before and even during your trip. They sometimes have discount coupons and their website and hotline are very useful! 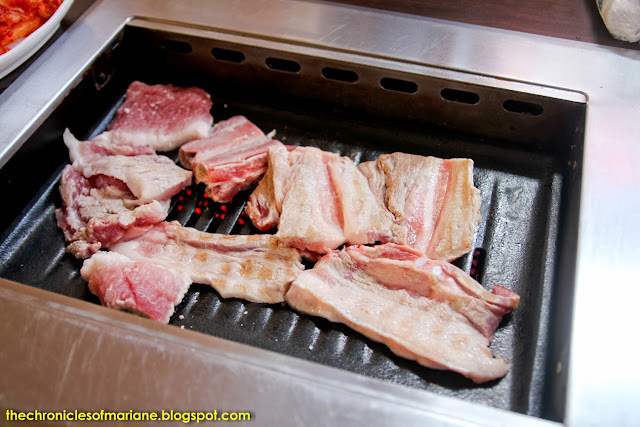 My impression of Korea? Simple. I fell in love at first sight. Seriously, half a year has already passed after this trip and I still have a "hangover". Maybe it was the weather that was the greatest reason for this. The beauty of Autumn never failed to amaze me each day of our stay. It added the extra "awesomeness" to all the places that we visited, and yes, I love cold temperatures (but would probably hate it during winter)! 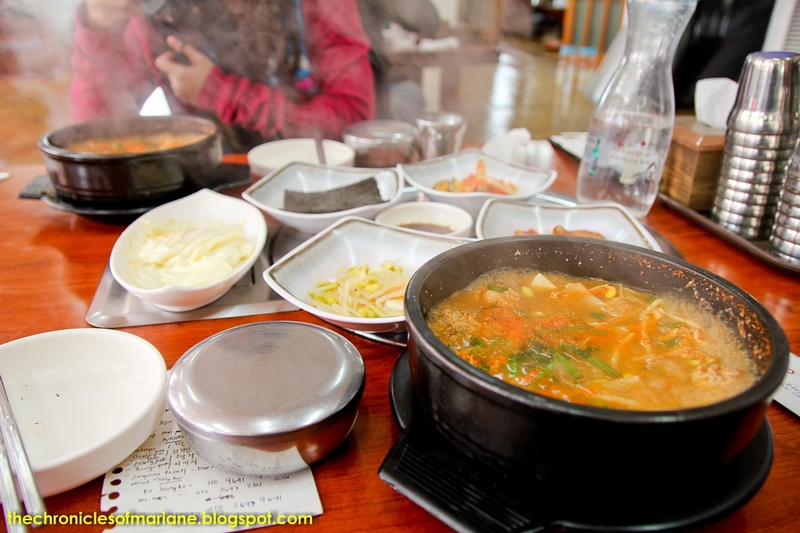 Another convincing factor why our trip was so epic was the Koreans themselves. Everyone was so friendly, polite and helpful. I felt like I belonged here (almost)! They always had a smile on their faces and have always been chatty and lent us a hand on our heavy luggage and inquiries on directions. I was also able to experience kindness that I would probably never receive in my own hometown. Each of the regions that we have visited has its own charm. 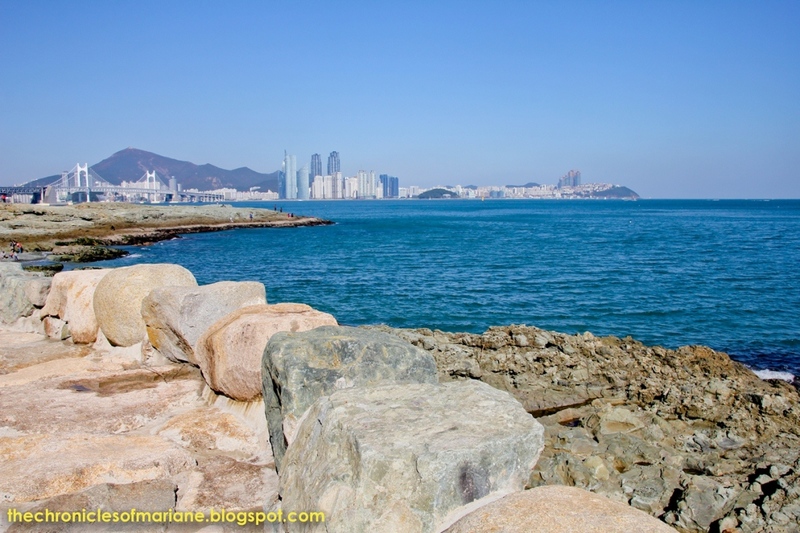 Busan for great scenery, beaches, etc - Busan is a big city like Seoul, however they are also so different in many ways. I can say that Busan locals are loud, in a good way. They're friendly too, if you're a Manilenyo or have been to Manila, the feel of the city is the same (yes, reckless bus drivers too! ), but less the trash and pollution. 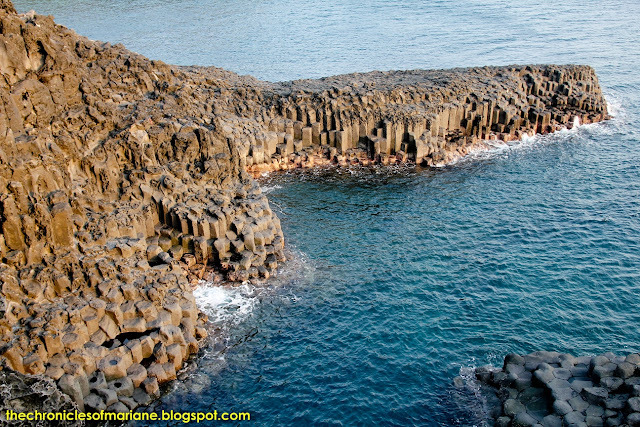 Jeju for nature lovers, people who love the tropical atmosphere - Though we came on a very cold time, Jeju has its feel that it's made for honeymooners. I can't really explain why though, it's like Hawaii, though there are only few beaches. 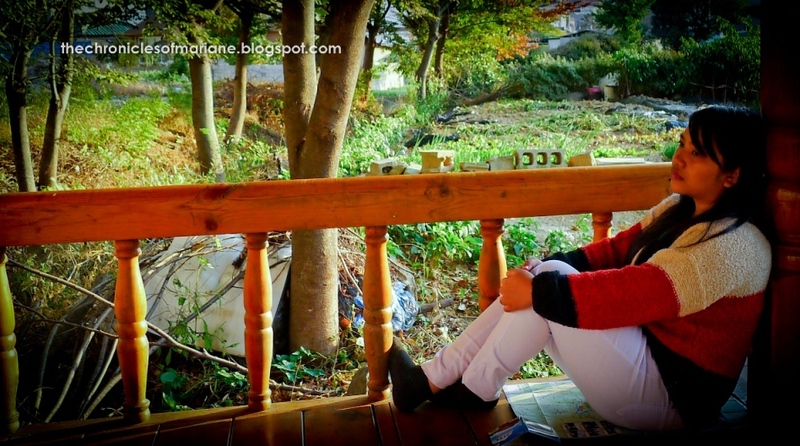 I think the half of Jeju has this luxurious ambiance to it because of the resorts and all, and the other half is a complete opposite because the life there is so laidback and simple. 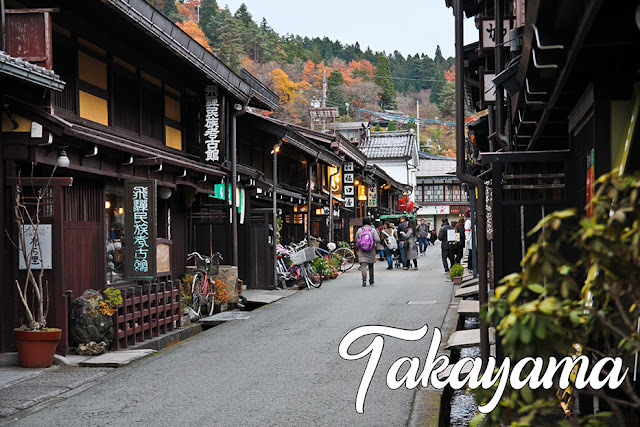 Both of these areas though have lots of tourists spots that you'll surely enjoy. 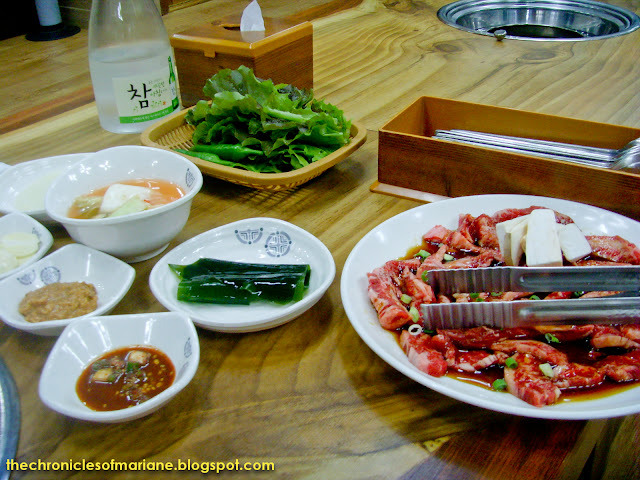 If you are to ask what my favorite places were, I think it would be Gyeonju, Suwon and Jeju, though I equally enjoyed all of what Korea has offered me all throughout my stay. 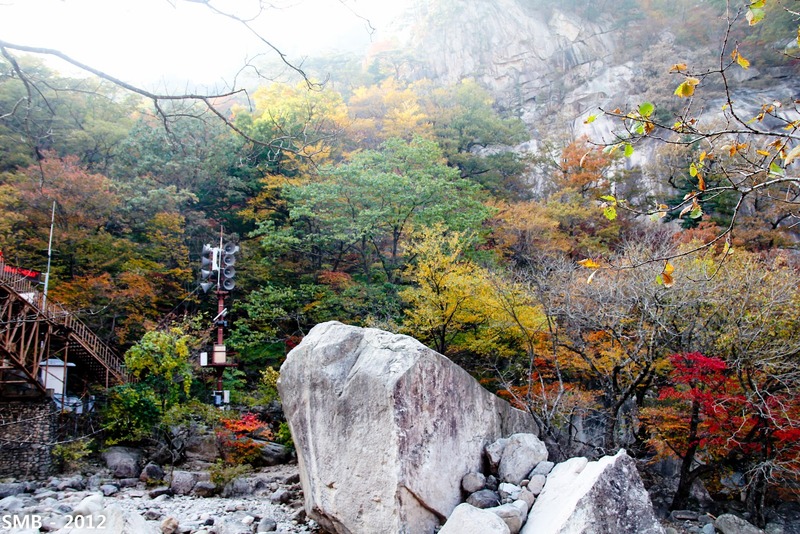 I would want to come back to Korea again, but probably during Spring as I can say I already have too much autumn pictures. Wow! 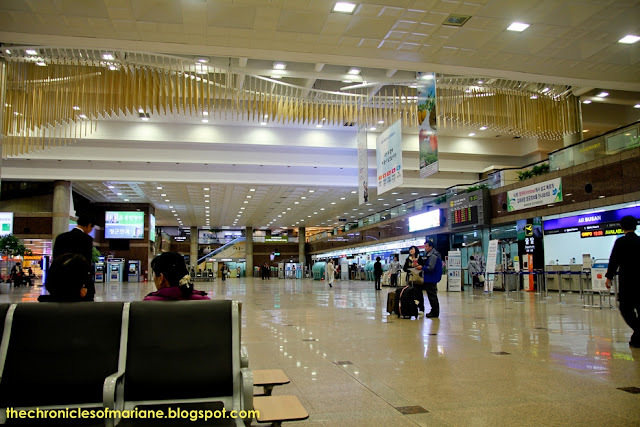 16 days in SoKor! 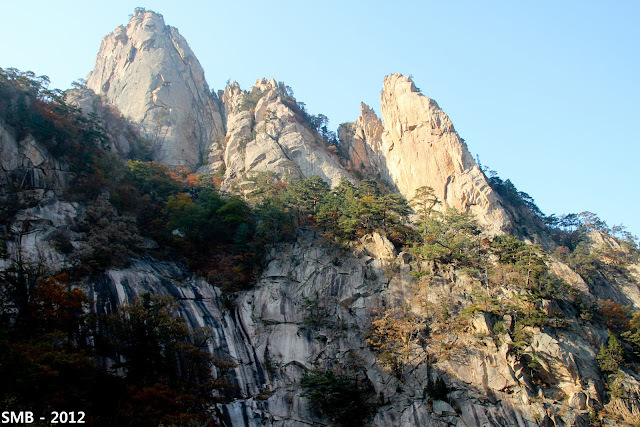 Isn't SoKor beautiful?! How much did you spend for 16 days? Hi Mustachio, ang cute ng username mo! SoKor is beautiful indeed. I think we spent a lot on food so I ended up spending around $800-$850. But going around the country will not require you too much compared to Singapore. Oh WOW! A splash of autumn colors. So enchanting. I reckon if we visit the country someday, it shall be the same season. Nice weather of heaps of walking too. Great shots! the photos look like they came out from a koreanovela! Hi! 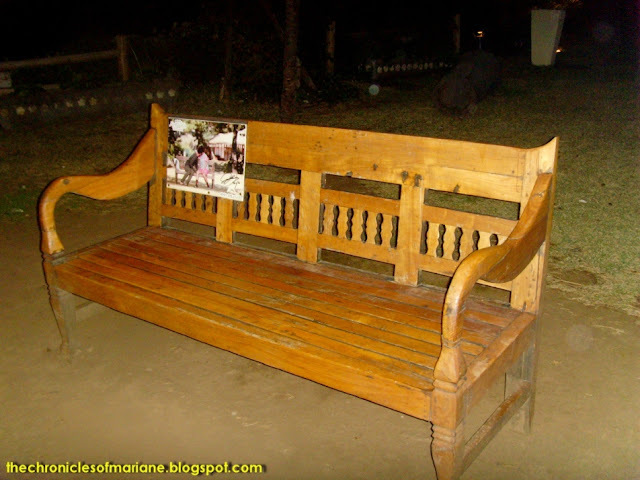 I stumbled upon your blog thru PEX. Nice one! You write so well. Just a question, what was the temperaturelike when you visited SK in Autumn last year? 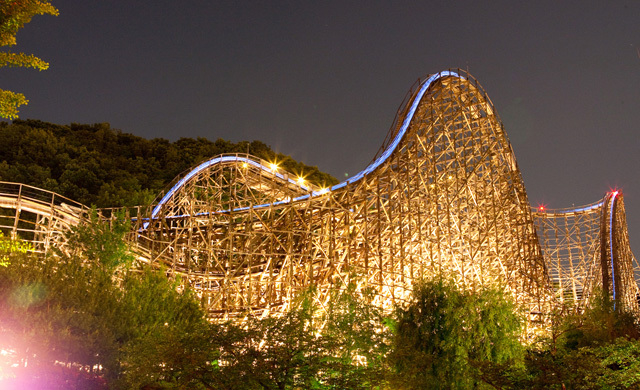 My family will be going there too on the same season (around first week of November). I'm asking so I know what to expect and what to pack. Hope to hear from you. Hello! Temperature was around 10 to 2 degrees that time. If you easily get cold stack up on thermals, however I was able to survive with normal pants and just 1 sweater, or 1 shirt + not-so-thick jacket. Gloves are also a must! Buy one pair of knitted/leather just to be sure. Hope this helps. I remember I have two outfit posts, maybe you can see this and gauge. Hi! I'm from Philippines, I'm planning to have a vacation in South Korea next month. how much did costed you for 16 days? Hi! It really depends on how you travel. In my case, I used Couchsurfing but spent around $800-$850 and bulk of the expenses were probably 50% on food and transpo probably 20% (as we booked quite pricy tickets to Jeju and other train fares as well). Wow! 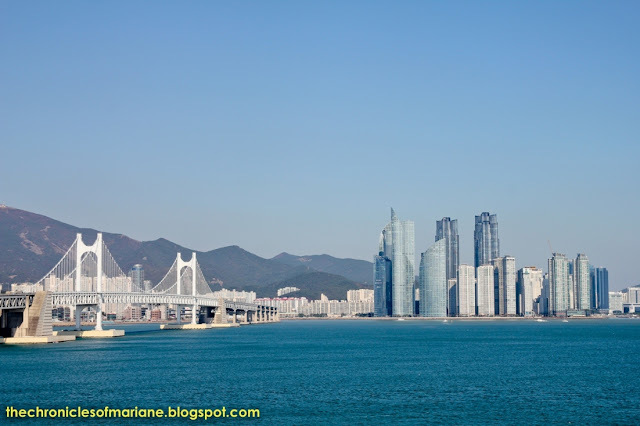 Reading your blog reminded me of the places we went to in Busan and Seoul! Such beautiful pictures! Sayang nga we missed the fireworks in Gwangali! Thanks May! 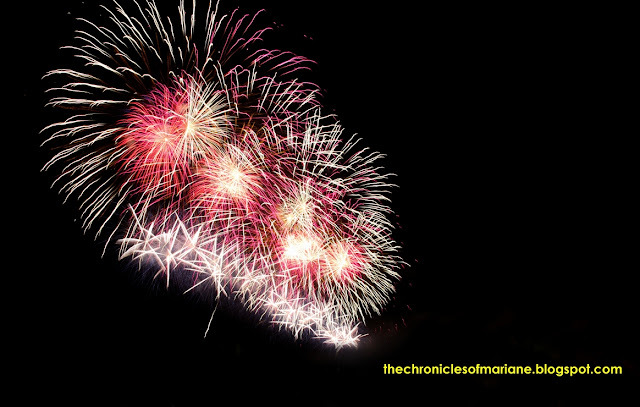 Ok lang siguro na di nyo naabot mas ok pa rin yung Pyromusical dito satin. 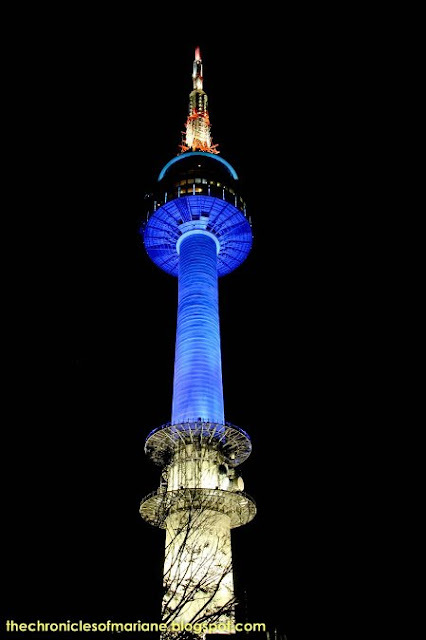 Nice account of your korean adventure. :D Buti ka pa fluent ata sa korean. Do you think someone who cannot communicate well in Korean can roam around the provinces of South Korea easily? Hi Mae! Yup, doable naman, super helpful naman ang Koreans kahit na may language barrier. If going around the provinces, I suggest carry a phone wherein you can always call Visit Korea hotline for directions if naligaw kayo and you can always go to Tourist Information Centers to gather maps, brochures, and the likes to get you equipped. Wow your blog really useful for traveller interested to the main spots of Korea!.What is your actual travel date in Autumn ? I am going to travel to Korea for 10 days from coming mid September.Just wander will we get the nice view at early autumn? Hi Jane, our exact dates were Oct 20-Nov4. Not sure how Korea looks during September but I reckon the autumn colors are not yet in full bloom as the fall season is just starting during this time. Better to check weather updates also but for the foliage peak. Hi there! 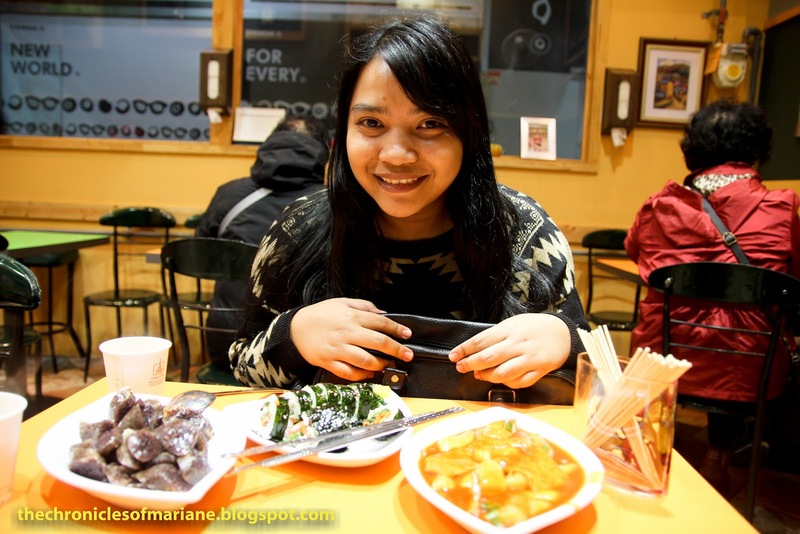 Stumbled upon ur blog as I was researching for places to visit in Korea this Oct. Loved all ur pics!! May i know the camera brand that was used? Cause i am amazed at the fireworks shot at night - superb! Thanks! Wow!! 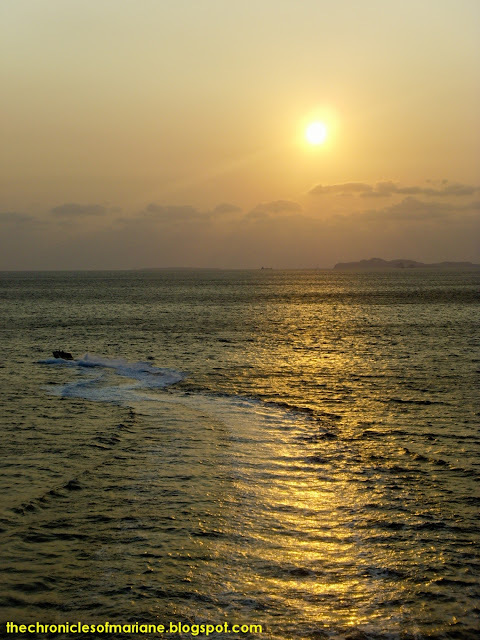 your pictures are amazing and you give very good suggestions :) I am also planning to go south Korea on 26oct to 10nov this year. May I hav your full itinerary as a reference? About the couchsurfing hosts, can you recommend the one who hosted you? At the moment, I'll travel alone. I hope not to spend more than SGD850 too :) Thank you. can you provide the charges for the driver in Jeju? is it possible to pre-book a driver beforehand or do we need to go airport & request for one? AFAIR it was 150,000 won for 8 hours you can either reserve beforehand or arrive at the airport and have the tourist center help you there. Tips are really useful, i am planning my next vacation in South Korea. Can you share with me the accommodations that you stayed ? 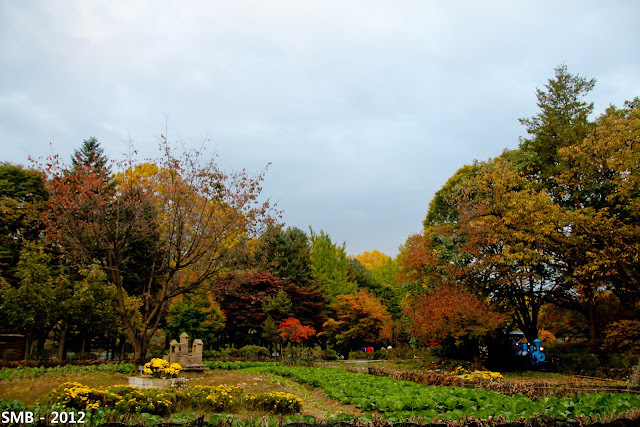 Hi I've been to South Korea and experienced autumn as well,,,This time I plan to travel to Jeju,,,,,,Is it as colorful as Mt. Seoraksan? 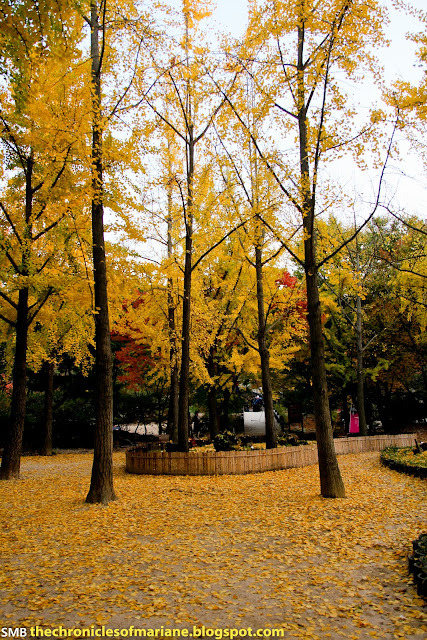 Are there maple trees around the island,,,,do I get the same autumn feeling just like in Nami Island? Hi! We will be going to korea next year sometime in autumn. May we know your itinerary? Your post is really awesome and helpful. :) daebak!!! 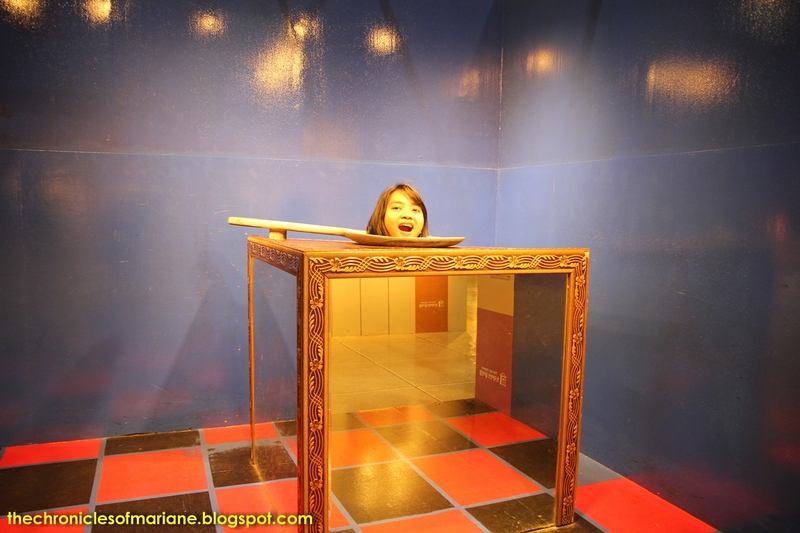 Hello Ms. Mariane, How was the processing of your travel visa? Hi Kick, thank you for the compliments! :) For 16 days I think 35,000 pesos ang nagastos ko, though we didn't spend anything for accommodation, Medyo mahal lodging sa Korea so be prepared to shell out 700-1,000 a night sa proper hostels pero if jjimjilbang pwede na 200-300 :) Go go go kaya mo ipunin yan! Hope you can go there too! Hi! 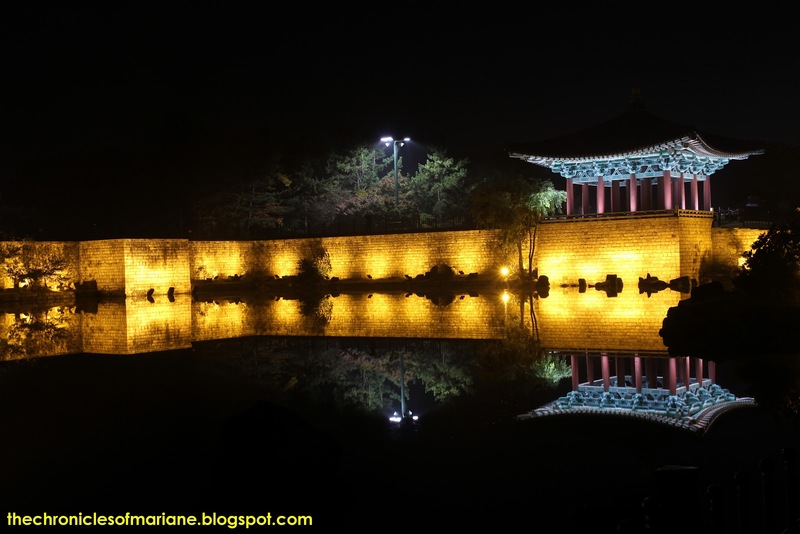 Just wanted to drop by and say that i enjoyed reading your posts about SK :) Seriously one of my favorite countries for reasons that i can't explain. Thus, i have made it some sort of a pilgrimage to go every year. It's a dream of mine to actually go on a one month trip and just visit the other places away from the city (of btw, i superbly adore). will definitely grab some points from your blog. 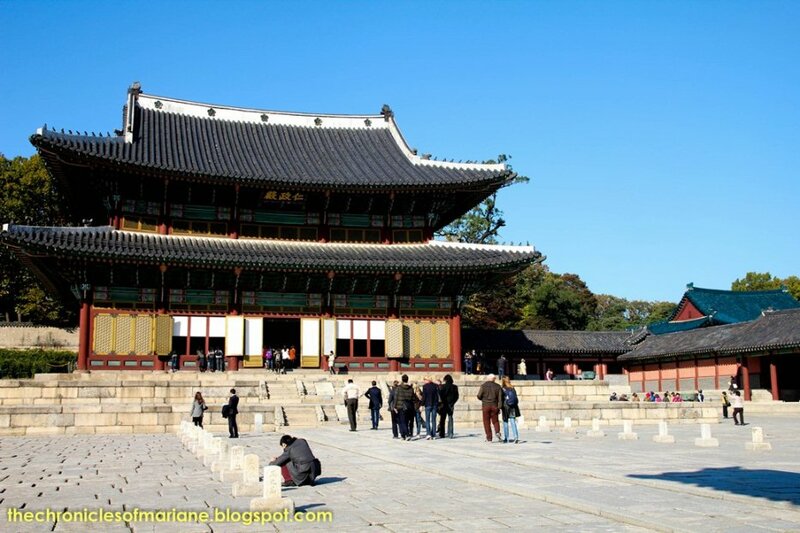 PS: i have been wanting to go to Bulguksa and Andong, but time doesn't afford me to do so. sorry for the late reply :( i seemed to have missed your comment. 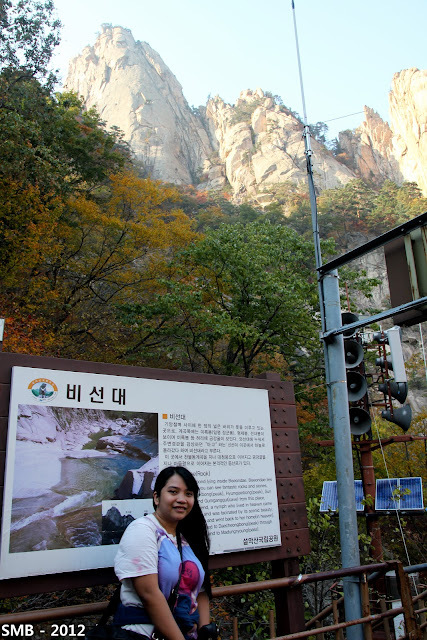 i agree, korea really is one nice country, bulguksa was great, next time I'll go to Andong! Sorry I am actually not very familiar na medyo nalimot ko na eh :P baka mpass is for mobile phones? Anyway purchase T-money super helpful, para syang credit card na you can use almost anywhere, sa 7-11, to trains, buses and even taxis! Usually around 20,000-30,000 won yung pinapaload ko, I think pwede mo rin sya refund after your trip. hi I just wanna ask how much is your ticket roundtrip from seoul to jeju and vise versa. hello ms. mariane, ask ko lng kung pwede ba na walang telephone number ung company. at yung bank is not a commercial one. You were really meticulous with your tips and suggestions on your trip and I am glad I found it just two weeks before my trip to Kimchiland! I have liked your FB page for future references. Hi Jeronimo! 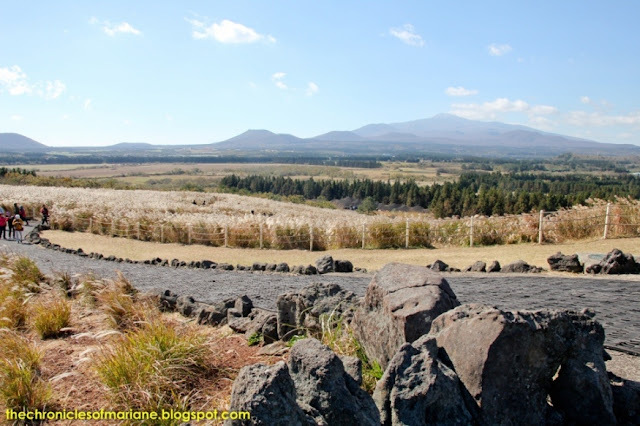 Have you been to Jeju? There's a limited resource regarding restaurants in Jeju. We're staying somewhere in East Jeju so it will definitely be a struggle. Hope you could help. 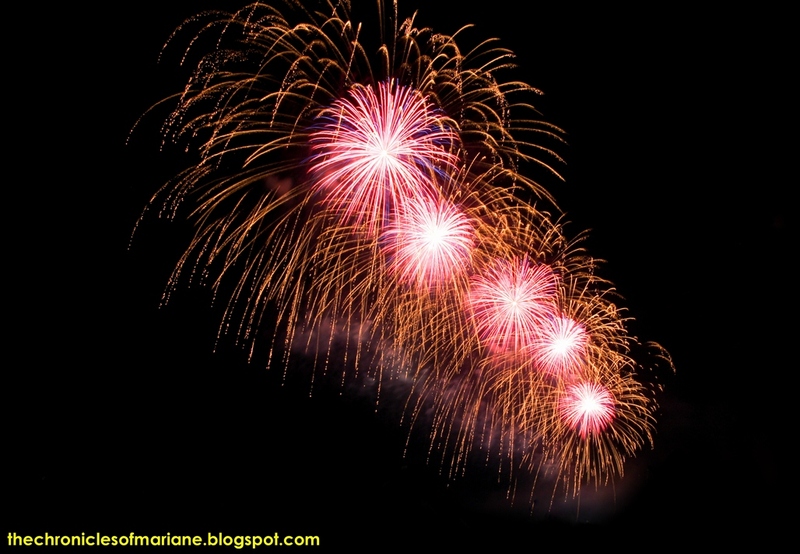 This was super-helpful - thanks Marianne! We are planning a 14 day trip from the UK this September and you have given me a lot of ideas for our itinerary!